Review date: 5 November 2004. Flashlights that sane people could afford used to use ordinary batteries described only with letters of the alphabet, and have incandescent bulbs. Then there were the little lights made by companies like SureFire, which ran from CR123 lithium batteries (commonly used in cameras), and were quite expensive, and really really bright. Now, though, there are lights that look pretty much like an expensive SureFire-ish thing, and run from 123 cells, and have respectable output thanks either to a single high output "super-LED" or a cluster of little 5mm LEDs... but which don't actually cost that much. Here are a couple of 'em. They've got a rubbery tailcap switch, they run from a pair of CR123s, they're small enough that you can hold them in your fist and only have a bit poke out on each side, and they've got impressive looking 12-LED lamps, giving them the kind of light output you'd expect from a first generation "one watt" super-LED flashlight. Yen Industries (who mainly sell PC gear, and whose Web site is apparently "the ideal click and buy solution for today’s busy society"...) asked me to check out a couple of these lights, which they're now selling here in Australia. That was because Yen were selling them for 55 Australian dollars, including batteries and delivery. That's about on par for a basic incandescent-globe SureFire flashlight (list prices for SureFire's LED lights start at $US125, as I write this, but their base model G2 Nitrolon is only $US34), but it's high for an anonymous Chinese-made light whose only visible brand is a mildly implausible little Walther-ish banner that says "POLICE". 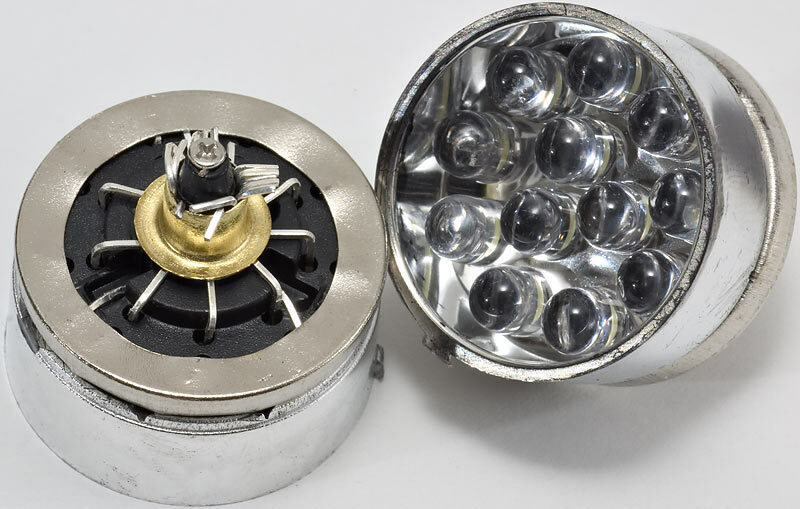 I also happened to know that Australian eBay dealers based in Hong Kong are selling the exact same lights for 30 Australian dollars, without batteries but including postage (and it's not hard for eBay shoppers in other countries to find them, either). A couple of CR123 batteries shouldn't cost you more than $AU10 - they're easy to find on eBay too. So I told Yen that they'd probably rather I didn't check these lights out, unless they were willing to drop the price. Australian buyers can now get one of these lights from Yen for $AU35, including batteries but not including delivery. And readers of this review can, by a mystic means I'll reveal at the end of this page, get them for $AU35 including batteries and delivery. $AU35 is, as I write this, about $US26.50. It's not a whole lot of money for a bright little flashlight that'll never need another bulb. The only remaining question was - are these bright little flashlights actually any good? 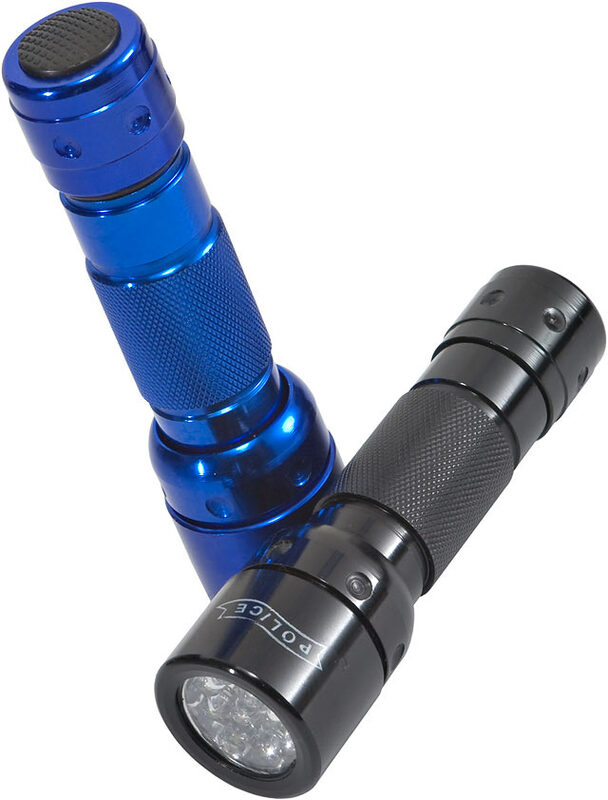 For your $AU35, you get a flashlight (in black, blue, silver or gunmetal grey; I got a blue one and a black one for review), two unknown-brand CR123 cells (all 123s are much the same as far as I know, so there's no reason not to buy cheap off-brand cells), and a neat little nylon pouch. The pouch has a hook-and-loop-closed flap, and a press-stud retaining strap that can go over or under the flap, and a metal loop on the back so you can hang it off a carabiner or what-have-you, and a belt loop as well, retained by another press-stud. 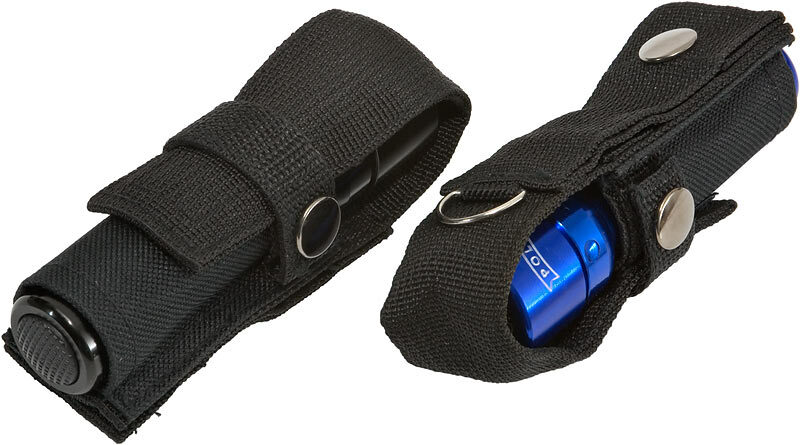 The pouch leaves the pushbutton switch on the end of the flashlight exposed at the bottom, so the light may turn on by accident, and its stitching leaves a bit to be desired, but it's solid and highly functional. The exposed switch isn't such a big deal, because it's only a momentary unit - it only turns the light on when you're holding the button down. To turn the light on constantly, you tighten the whole end-cap down. 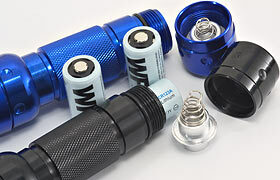 This is a simple, cheap and quite reliable kind of switch, but most flashlights that use it end up not being waterproof, either because the button switch is un-sealed, or because you can't screw the tailcap down far enough to make the flashlight watertight without turning it on. So the lights may have nice O-ring seals at each end - as the Yen lights ones do - but they still only qualify as "rainproof", at best. You can't expect any flashlight with a pushbutton to be useful at any great depth, by the way. Either it'll leak - at the button or somewhere else - or the water pressure will press the button for you. But the Yen lights should fear no normal puddle. The 12-LED lamp delivers a decent beam, too - the same kind of beam you always get from 5mm LED arrays. It's a smooth, even pool of light shading from a wide hot spot in the middle out to a very broad "spill" area. Overall, it looks much nicer than the beam from all but the most exotic of incandescent-bulb flashlights. There's roughly a 40cm pool of light at one metre, depending on where you say the edge is, and some light out far enough to make this an excellent light for seeing where you're walking at night, or illuminating other nearby things. The down side of this is that the beam's too wide to be very useful for spotting things at a distance. Like all 5mm-LED-array lights, the Yen ones don't let you focus the beam at all. The beam's distinctly blue-white, which is common for cheaper LEDs, but doesn't bother me at all; it's far nicer than the yellow-white of most incandescents. The Yen light lamp assemblies also don't quite point straight forward, but they're not badly off-centre; I didn't notice the problem until I twirled the light around in my hand. ...which, at first glance, looks a bit alarming. Yep, that's a bunch of untrimmed LED leads splayed out around the screw that holds the lamp terminal on. It looks as if there's a squashed bug in there. This isn't as bad as you might think, though. Crimped/clamped connections like this are electrically OK; as long as salt water doesn't get in there and turn the unsoldered connection into a corrosion nightmare, it ought to work fine for ages. The construction of these lights also ought to make them quite hackable. They don't have any parts that're pressed, glued or welded together, and it's easy to get at all of the parts, so flashlight fiddlers could quite easily graft on new lamps, switches, battery compartments, LED driver circuits, et cetera. Through my multimeter - which adds a bit of resistance of its own and reduces the current draw - one of these flashlights started out drawing about 0.37 amps from fresh batteries. If the output voltage of the two 3V batteries wasn't sagging, that'd means a lamp power of 2.2 watts. But the output voltage will sag significantly under a load like this, and some of the power consumption - but they are, so the real lamp power is probably below two watts. If it's, say, 1.8W, then each LED's being run at only 0.15 watts, which is not at all outrageous for a modern 5mm LED with a bit of heat sinking. So the LEDs should last just fine; five years of constant on-time before they get down to 80% brightness should be quite attainable. Again from fresh cells, the middle of the flashlight's sizeable light pool scored a quite respectable 120 lux at one metre. That's a lot dimmer than the 400 lux my single-123-cell Arc-LS manages, but the Arc has a narrower beam with a much more distinct central hot spot; its total light output is not a lot higher than the Yen flashlight's, if at all. Compare the Yen light with a really bright two-123-cell flashlight like Elektro Lumens' XM-2, and it loses miserably. The XM-2 is a little longer than the Yen light, and it also has a narrower beam, but its overdriven three watt Luxeon Star lamp gives it a 900 lux centre-of-beam score, and far more overall output. But the XM-2's sixty US bucks, ex shipping, batteries not included, and its batteries won't last as long as the Yen's. And it's too bright for many applications - for just seeing where your feet are going, poking around behind a desk or wandering to the bathroom in the middle of the night, an XM-2 is not just overkill - it's annoying. A big reason to choose 123 cells for small flashlights is that they are, well, small - a couple of CR123s weigh only about 31 grams. Four AA alkalines weigh about 92g. The whole Yen flashlight only weighs about 130 grams, and is well under 12cm long; there's no way you could fit four AAs into it without making it rather fat. It used to be a bit tricky to find 123 cells for a decent price, but now it's quite easy. They're still considerably more expensive than alkalines, though. A typical brand name AA alkaline (PDF datasheet here) will offer more than 2.8 amp-hour capacity into a small load, but at a constant 400mA you can only expect about four or five hours of service - 1.6 to 2Ah. A simple LED flashlight like the Yen, which has no voltage regulator circuit doesn't present a constant current load - it behaves more like a resistive load. For back-of-an-envelope-calculation purposes, you can assume the Yen light is a 15 ohm load for a six volt supply, equivalent to a 3.75 ohm load across each of the four 1.5 volt AAs that'd be needed to equal the nominal voltage of two 3V CR123s. Into that resistance, you can expect about six hours of service down to 0.8 volts per cell from a decent alkaline, and then plenty more hours at lower and lower brightness. Now, 123 cells (PDF datasheet here) tend to be specified for photo-type loads, which are heavy when the flash is charging, but generally pretty infrequent. So it's hard to compare their performance with more general purpose batteries. This Duracell PDF has lots of graphs, but not much more information for flashlight-powering purposes. 123s in "tactical" flashlights often do have to deal with camera-like loads, mind you, since the lights are often used for brief bursts of perpetrator-stunning light, not constant illumination. Fudging from the 100 ohm load figures and factoring in some capacity sag based on the much higher drain, I think most people should still be quite happy with the light the Yen flashlights deliver after at least three hours of constant service. Maybe four. And, once again, you'll get better-than-nothing light for a long time after that, because LEDs only know how to deliver the one colour of light; they don't slide down into the useless infrared when their batteries go flat, like incandescent bulbs. If you go down into a cave with some LED flashlights and badly miscalculate the battery life they're going to get, you'll probably still be able to come back out again. Do the same thing with incandescent-bulb lights and what's left of you down there may well be frightening better-prepared cavers for many years to come. So - where to get batteries? Well, Australian eBay dealers sell ten-packs of 123s for around $AU40 delivered; you might as well buy ten, since you ought to have no trouble using 'em all up before their ten year shelf life expires. In the USA, you're talking maybe $US28 delivered for ten brand-name cells bought on eBay. Some of the major flashlight manufacturers sell 123s really cheaply, too; as I write this, a box of 12 from SureFire will set you back only $US15 plus shipping. I wasn't blown away by the Yen flashlights. Their overall fit and finish is pretty ordinary compared with the (much more expensive) tactical lights they resemble, their anodising is thin and scratchable, they're not quite waterproof, and the little "Police" banner is cheesy. But they do seem solidly enough made, and they are not expensive, for what they are. They're also good general purpose lights. Not too bright for peeking at the back of a computer, not too dim to show you what's over there on the other side of the garden, and a wide enough beam to light up a car's whole engine bay if you find yourself having one of those special moments in the middle of a rainy night. Lithium batteries mean they'll still work even if you leave them in a drawer until 2014 AD, the LED lamp means you'll never blow a bulb at an inconvenient moment, they're small enough to fit in a jeans pocket without making you feel as if you're smuggling a zucchini, and the complimentary pouch means anybody can carry one, as long as they don't mind looking a bit security-guard-ish. For $AU35, batteries included, they're a great buy. Accordingly, they get a Recommended from me. And now, the secret code that'll let Australian buyers get free shipping. When you order, put "DansData" in the comments field of the order form (that's also where you should mention the colour of the light you'd want, by the way). And then you'll get free shipping (the shipping fee still appears on the order form, as I write this, but you don't have to pay it), and I'll get a cut of the action, which I will spend on Lego use to make Dan's Data even better.